As discussed in the introduction, laser returns from a mobile LiDAR system must be georeferenced, i.e. placed into a local or global coordinate system by combining data from the laser and from a GNSS/IMU. As of this writing, PDAL does not include generic georeferencing tools — this is considered future work. However, the Optech csd file format includes both laser return and GNSS/IMU data in the same file, and the PDAL csd reader includes built in georeferencing support. In this section, we will demonstrate how to georeference an Optech csd file and reproject that file into a UTM projection. Optech’s csd format is just one of several vendor-specific data formats PDAL supports; we also support data files directly from RIEGL sensors and from several project-specific government platforms. The file S1C1_csd_004.csd contains airborne data from an Optech sensor. Without georeferencing these points, they would be impossible to interpret — once they are georeferenced, we will be able to inspect and analyze these points like any other point cloud. The point cloud is, by default, in WGS84, but we will reproject these points to a UTM coordinate system for visualization purposes. Because these are raw data coming from the sensor, these data are noisy. In particular, there are a few points very close to the sensor which were probably caused by air returns or laser light reflecting off of part of the airplane or sensor. These points have very high intensity values, which will screw up our visualization. We will use the filters.range PDAL filter to drop all points with very high intensity values. These data were provided by Dr. Craig Glennie and were collected by NCALM, the National Center for Airborne Laser Mapping. The collect area is southwest of Austin, TX. 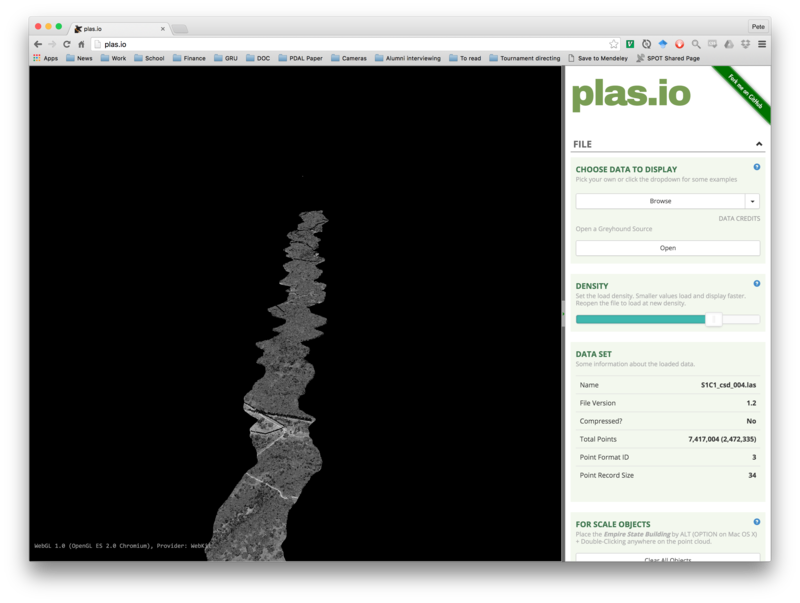 View your georeferenced point cloud in http://plas.io. Our airborne laser point cloud after georeferencing, reprojection, and intensity filtering.